"I think so far I've given away close to 150… I've been meeting with every CPA, tax attorney, business broker, mortgage banker, and anyone else I know that could refer me clients, and asking them how many others in their firm could use this "cheat sheet"? "One CPA asked for 15, so everyone in his firm that is doing taxes has my name, contact info, and photo close by them at all times… They can count on getting them from me every year going forward." For many years now, smart Financial Advisors have been sharing Horsesmouth's Key Financial Data cards with clients, prospects, CPAs, attorneys, and other professionals. The Key Financial Data cards are a calming influence in an otherwise topsy-turvy world. Why? Because the cards quietly deliver what is true and real about the coming year's tax brackets, thresholds, limitations and exemptions. No scary CNBC analysts. No pitch forks and torches. No exploding heads. Instant, branded PDF—Share it right now. Printed, branded cards—Mail/hand out all year. So go ahead now and take your first, easy step to including Key Financial Data, 2019 as part of your client communication program throughout the year. If you're looking to build your referral network among local professionals in your community, here are two examples of what advisors are doing with Key Data. Having been in practice since 1986, when it comes to marketing, I have tried lots of things. I do not think I have gotten more mileage out of anything as much as I have out of Horsesmouth's Key Financial Data cards. I have lost count of the number of unsolicited "Thank yous" and requests for more copies from CPAs, attorneys and other centers of influence. And now I have the ability to customize them with my contact information and my professional photograph. It's good to know that I am hiding under so many blotters on desks throughout Raleigh, NC." Because it's an impressive, easy-to-implement client communication program, perfect for sending throughout the year. Because it demonstrates your commitment to being a client-centered advisor by letting them know you're watching what's going on in government and how it affects their portfolio. Because it inspires confidence. Even if clients don't pore over every table of Key Financial Data, simply receiving it from you reinforces your image as an informed, organized professional. Because it shows you appreciate your clients. When you take the time to personalize your Key Financial Data cards and send them out to your clients, it also shows your clients that you're keeping them informed and that you appreciate having the chance to work with them. Because it shows you're committed to being a "can-do, results-oriented" advisor. You don't let changes in government rules and regulations just happen and let your clients' CPAs deal with them later. You're on the case. When you pass along a Key Financial Data, 2019 card to clients, prospects and allies, there's no easier and simpler way to remind people of your commitment, expertise, and professionalism. Order Your Key Financial Data, 2019 Cards Today! For less than 62 cents a day you can have the Key Financial Data, 2019 cards work for you. Branded PDF for instant use with clients and prospects starting right now. REMEMBER: The data will likely change. This client communication program is all about you keeping in touch and letting them know you're on the case as events and facts change—which they will! 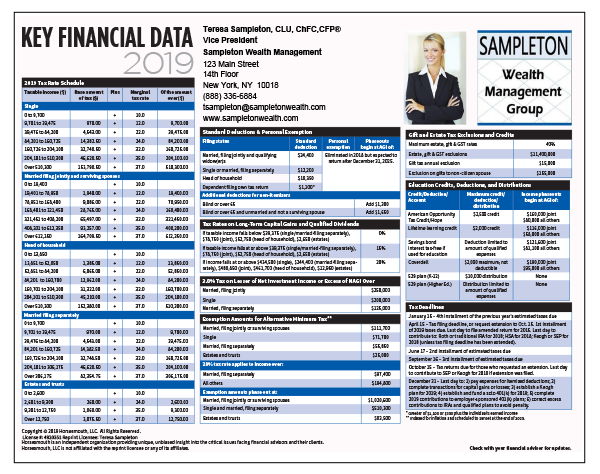 Key Financial Data, 2019 that you can send in the mail, hand out in person and include in any other client or marketing campaigns. The branded, coated, 8.5 x 11 Key Financial Data card is the type of client handout that reinforces your reputation as a client-centered, forward-thinking advisor. SPECIAL ALERT: Unlimited PDF updates throughout the year. We'll send you an email alerting you to new updates to the PDF version of Key Financial Data, 2019. And we'll explain the changes and tell you how best to communicate them to your clients. 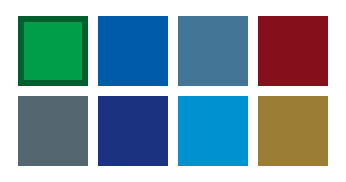 Since 1997, Horsesmouth has been helping financial advisors succeed by providing timely guidance on key topics such as business development, practice management, financial planning and investment strategies.